Thailand's strides in digital technology will be on show to an international audience when the country takes part in World Expo 2020 in Dubai. Preparations are under way for the event, which will highlight the progress made under the government’s 4.0 policy, particularly with the development of the Eastern Economic Corridor (EEC) and advances in the new S-curve industries - especially in agriculture, food, bio-fuel, and digital businesses. To be presented under the concept of “Mobility for the Future”, the Thailand Pavilion at the expo will feature the many developments in the three EEC provinces of Chon Buri, Chachoengsao and Rayong, especially with the opening of U-Tapao International Airport and the launch of high-speed trains connecting it with the Suvarnabhumi and Don Mueng airports. Also highlighted will be the launch of two deep-sea ports, at Laem Chabang and Map Ta Phut. The Minister of Digital Economy and Society, Pichet Durongkaveroj, said that the ministry is honoured to be responsible for encouraging the collaboration that will go into organising the Thailand Pavilion. The expo will be held for six months from October 20, 2020. “The event will provide a global stage for Thailand to announce the country's readiness to become a leader in digital technology in Asean,” said Pichet. 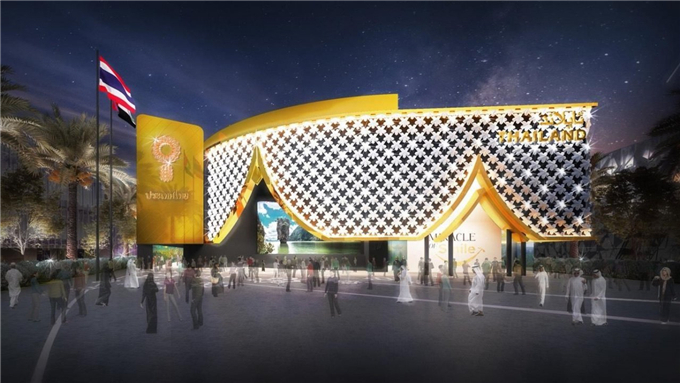 He said the Thailand Pavilion, covering 3,600 square metres, will be much larger than the 2,000 square metres that Thailand had at the Milan expo five years ago. About Bt900 million will be spent by the government for the construction of the pavilion and other expense during the six-month exhibition in Dubai. Of more than 25 million people expected to go to the Dubai expo, about seven million are targeted to visit the Thailand Pavilion. He said that the ministry has also set up a test centre for a 5G network at Kasetsart University, Sriracha Campus, to support the development of the EEC initiative in the three participating provinces. The tourism sector has also launched a strategy to attract more quality tourists from all over the world. With about 40 million inbound tourists expected to visit the country this year, Thailand will become the fifth-biggest tourist destination in the world by number of arrivals. “World Expo 2020 Dubai will be the stage for Thailand to demonstrate its readiness in digital technology as well as the impressive images of the country, especially Thailand's achievement to create seamless innovation based on its traditional resources and wisdom,” Pichet said.